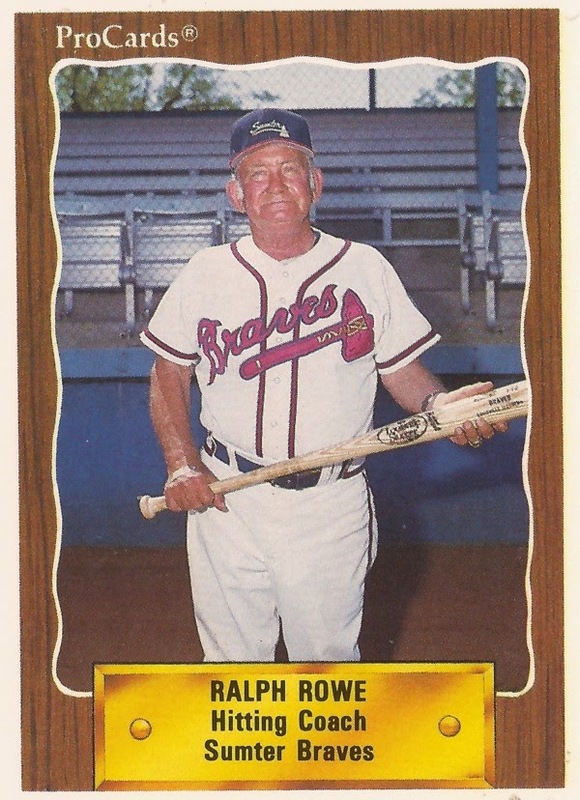 Ralph Rowe was in a position to know how good his 1990 Sumter Brave hitters were. His baseball playing and coaching career stretched back nearly 50 years, including major league stints with the Twins and Orioles. But that Sumter squad, he told The Sumter Item that May, was different. It was a team that included Ryan Klesko, Vinny Castilla, Tyler Houston and Tony Tarasco. "I had some great individuals when I was with the Twins," Rowe told The Item, "but overall, I'd have to say this is the best group I've seen. You can't give up on any of these kids, because they all have ability." Rowe served as a minor league coach for the Braves after serving four seasons as a major league coach for Baltimore in the early 1980s, including their World Series-winning year of 1983. He also spent four seasons as a coach with the Twins in the 1970s. Rowe's career in baseball began back in 1942 when the 17-year-old South Carolina-native was credited with playing 46 games in the Indians system at Class D Thomasville. He is next credited as taking the field in 1947 with independent Class B Rock Hill. In July 1948, Rowe was described by the Spartanburg Herald-Journal as "Rock Hill's hard-hitting outfielder" as he had a mid-season average of .366. Rowe returned to an affiliated team in 1949 with the Cubs, playing largely at single-A Macon. He also got 14 games at AAA Los Angeles. Rowe continued playing through the end of the 1950s, spending his final seasons as a player-coach. His final eight recorded games came in 1961 at single-A Charlotte. His first coaching job came in 1959, named the manager of the Pioneer League's Missoula Timberjacks. Rowe later joined the Twins system as a minor league manager, eventually becoming manager of AAA Portland in 1971. In 1966, Rowe served as manager at single-A Thomasville. He spoke to The Herald-Journal that May on several topics of the day, including bonuses paid to players that then topped $50,000. "I signed to play for $80 a week and a bus ticket," Rowe told The Herald-Journal. I don't see how a player who signs one of these $50,000 bonuses could be as hungry to play as I was. I don't think that I would have played as hard with all that money in my pocket." Rowe made the majors in 1972, named a coach for Minnesota. He stayed with the team through at least 1975. He served 1974 as the team's third base coach. In 1973, Rowe's team was noticeably hitting better. Asked by The Associated Press if work with the team's new video tape machine was responsible, Rowe said it wasn't. "I can see with my own eyes what a hitter is doing and should be doing," Rowe told The AP. "I don't need a machine to tell me a guy is pulling his head out." Rowe joined Baltimore as a coach in 1981 and he continued using that eye for hitting. In the 1983 ALCS, Rowe made an in-game suggestion Tito Landrum in the ALCS, according to The AP, and Landrum came through with an extra-inning home run to send the team on to a win and the series win. "That little man hit the ball as hard as anyone I've ever seen," Rowe told The AP afterward of Landrum's home run, "and I've been connected with guys like Harmon Killebrew." Rowe then joined the Braves. He served 1986 as the club's minor league hitting instructor. In 1990, he was hitting coach at Sumter. Rowe passed away in 1996 at the age of 71.